Objective To compare the methodological quality and conclusions in Cochrane reviews with those in industry supported meta-analyses and other meta-analyses of the same drugs. Design Systematic review comparing pairs of meta-analyses that studied the same two drugs in the same disease and were published within two years of each other. Data sources Cochrane Database of Systematic Reviews (2003, issue 1), PubMed, and Embase. Data extraction Two observers independently extracted data and used a validated scale to judge the methodological quality of the reviews. Results 175 of 1596 Cochrane reviews had a meta-analysis that compared two drugs. Twenty four meta-analyses that matched the Cochrane reviews were found: eight were industry supported, nine had undeclared support, and seven had no support or were supported by non-industry sources. On a 0-7 scale, the median quality score was 7 for Cochrane reviews and 3 for other reviews (P < 0.01). Compared with industry supported reviews and reviews with undeclared support, Cochrane reviews had more often considered the potential for bias in the review—for example, by describing the method of concealment of allocation and describing excluded patients or studies. The seven industry supported reviews that had conclusions recommended the experimental drug without reservations, compared with none of the Cochrane reviews (P = 0.02), although the estimated treatment effect was similar on average (z = 0.46, P = 0.64). Reviews with undeclared support and reviews with not for profit support or no support had conclusions that were similar in cautiousness to the Cochrane reviews. Bias in drug trials is common and often favours the sponsor's product.1–3 Critical, systematic reviews that aggregate the available information in a neutral manner are therefore essential. Cochrane reviews aim to minimise bias and avoid conflicts of interest,4 and, on average, they may have greater methodological rigour than systematic reviews published in paper based journals.5 6 We therefore hypothesised that Cochrane reviews would be more transparent and less biased than industry supported systematic reviews. We aimed to compare Cochrane reviews with other meta-analyses of the same drugs, which we divided into those that had industry support, those with undeclared support, and those that had non-profit support or no support. We searched for pairs that consisted of a Cochrane review and a similar review in a paper based journal. A Cochrane review was eligible if it used meta-analysis to compare at least two different drugs or classes of drugs; was published in the Cochrane Database of Systematic Reviews 2003, issue 1; could be matched with a metaanalysis of the same drugs and diseases published in full in a paper based journal within two years before or after the most recent substantive amendment of the Cochrane review; and had no authors in common with the Cochrane review. We defined support by the pharmaceutical industry as provision of grants, authorship, or other major assistance such as help with the statistical analysis. We did not consider provision of references or unpublished trial reports as support. One investigator (AWJ) hand searched all reviews in the Cochrane Database of Systematic Reviews 2003, issue 1 for drug comparisons. 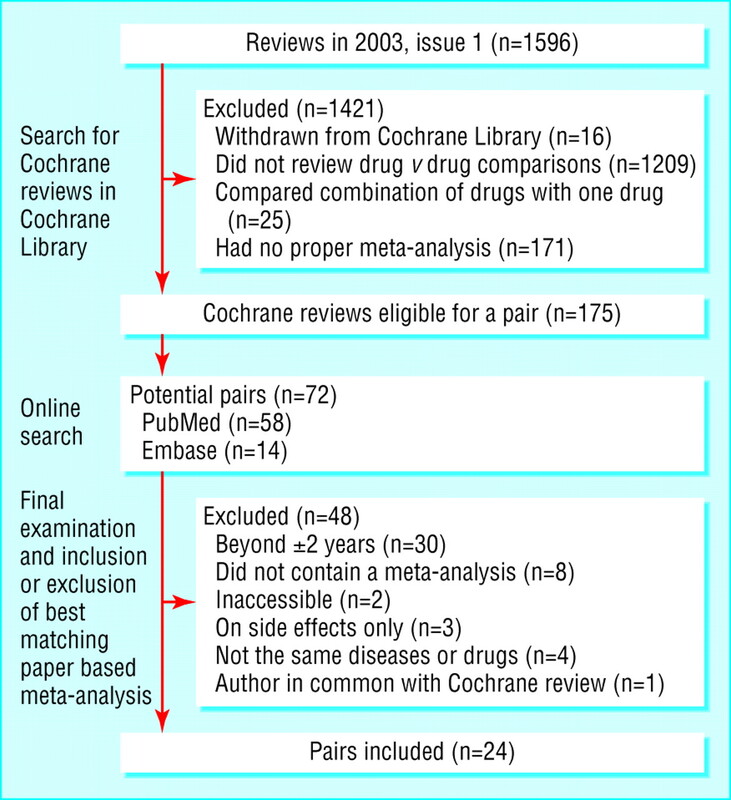 For each potentially eligible Cochrane review, we sought possibly eligible paper based reviews by searching PubMed (January 1966 to July 2003) for the same diseases and drugs combined with “meta-analysis” or meta-analysis[pt]. From online inspection of titles and abstracts, we selected metaanalyses for examination of the full text. When we found no match in PubMed, we searched Embase (WebSPIRS 5) (1980 to August 2003). When we found more than one match with the same type of support, we chose the one with the closest publication date to the Cochrane review. AWJ and PCG independently assessed each pair of reviews in random order, by reading the Cochrane review first in half of the pairs. We used a pilot tested data sheet and resolved disagreements by discussion. We were not blinded. We extracted data on the date of the most recent substantive amendment to the Cochrane review and of the publication of the paper based review; names of relevant drugs and diseases; types of support; number and type of sources used to identify trials for the review; searches for unpublished trials; and descriptions of concealment of allocation, details of blinding, and excluded patients and trials. We assessed the methodological quality of the reviews with Oxman and Guyatt's index, which is a validated tool with nine items considering the potential for bias and an overall assessment on a 0-7 scale.7–9 We judged the review authors' conclusions by assessing whether the experimental intervention was recommended without reservations or whether it was not recommended or recommended only with reservations.3 As our data were paired, we compared quantitative data with the Wilcoxon-Pratt one sample rank sum test and binary data with a sign test; P values are two sided. For the industry supported reviews, we also assessed whether the estimated treatment effects were different from those reported in the Cochrane reviews. We used the first reported outcome with data in the industry supported review that was also presented in the Cochrane review, and we also did the corresponding analysis in which we started with the first reported outcome in the Cochrane review. We calculated pooled comparative z scores, after adjustment for the number of patients contributing to the outcome and for the number of patients that were common to the two analyses (see appendix on bmj.com for details). The overall median quality score was 7 for the 24 Cochrane reviews and 3 for the other reviews (P < 0.001; table A on bmj.com). The mean years of publication for the three sets of pairs were 2000 versus 2000 for Cochrane reviews versus industry supported reviews, 2000 versus 1999 for Cochrane reviews versus reviews with undeclared support, and 2000 versus 2000 for Cochrane reviews versus reviews with non-profit or no support; the median differences in number of included trials were 0, 1, and 1 (table B on bmj.com). Cochrane reviews were of higher quality than industry supported reviews (P < 0.01). They also more often stated the search methods used to find studies (P = 0.06), searched comprehensively (P = 0.06), avoided bias in the selection of studies (P = 0.03), reported criteria for assessing the validity of the studies (P = 0.03), used appropriate criteria in assessing the studies (P < 0.01) (table A), described methods of concealment of allocation (P = 0.02), and described excluded patients (P = 0.03) and studies (P = 0.03), and they used more sources to identify studies (P = 0.02) (table B). One of the industry supported reviews had no conclusion, as it referred to physiological characteristics of the drug.w6 The other seven reviews supported by industry all recommended the experimental drug without reservations, compared with none of the Cochrane reviews (P < 0.01). This difference was related to interpretation of the data (table) and consideration of costs. The authors of six of the eight Cochrane reviews had reservations about the quality or relevance of the trials or their findings,w1 w5 w7 w9 w11 w17 and two noted that the effect decreased with increasing sample size.w5 w9 Seven mentioned the higher cost of the experimental drug as a problem compared with none of the industry supported reviews, of which two claimed that economic analyses had shown that the experimental drug was cost effective.w4 w18 In contrast to these interpretations, the estimated treatment effect was similar, on average, in the pairs of reviews (pooled z = 0.46, P = 0.64; appendix and table C on bmj.com). However, the scatter of the comparative z scores was high (χ2 = 19.4, df = 6, P = 0.004), which partly reflects differential inclusion of trials and patients despite our close matching (table C) and partly could be caused by selective or biased handling of data. The results for the comparison with reviews with undeclared support were similar to those for the industry supported reviews (table A), except that no significant differences existed for the stated search methods (P = 1.00) or efforts to avoid bias in the selection of studies (P = 0.22) and the recommendations were without reservations in one Cochrane review and in two other reviews (P = 1.00). We found no significant differences between Cochrane reviews and reviews with non-profit or no support (table A). The recommendations were without reservations in two Cochrane reviews and in one other review. However, in three pairs of reviews the conclusions favoured different drugs. In one set, although the same trials were included, the authors had different views on the trade-off between benefits and harms. The Cochrane review strongly supported the use of warfarin in patients with atrial fibrillation with average or greater risk of stroke,w35 whereas the paper based review strongly favoured antiplatelet drugs.w36 In another set, the paper review found better control of haemorrhage with octreotide.w40 The Cochrane review did not find any differences but referred to another meta-analysis when it emphasised that terlipressin is the only drug for which a reduction in mortality has been found compared with no treatment.w39 We have published a comment with this review, as we doubt that the effect on mortality is reliable. We found that although some Cochrane reviews had clear methodological deficiencies, these were fewer, on average, than in reviews published in paper based journals. A minor limitation was that we could not be blinded, as the layout of Cochrane reviews is unique; blinding has little impact on extraction of data for reviews.10 A more important limitation is that our sample was small and needs to be replicated. Furthermore, we are affiliated with a Cochrane centre, and Cochrane reviews are done according to a handbook11 that was developed partly by Andy Oxman, who also participated in the development of the validated index that we used for evaluating methodological quality.9 12 To help readers to make their own judgments, we have provided details on the comparison with industry supported reviews (table) and added items to our data extraction sheet that are indisputably important for the reliability of reviews, such as adequate concealment of allocation.13 14 Our findings correspond to another recent finding that Cochrane reviews assess methodological quality more often than do other reviews,15 although because of space constraints some paper based reviews might have been conducted better than was reported. The estimated treatment effects in industry supported reviews were similar to those of Cochrane reviews, but the former had uniformly positive recommendations for the experimental drug, without reservations about methodological limitations of the trials or costs, in contrast to none of the Cochrane reviews. This suggests that the main problem with industry supported reviews lies in how conclusions are formulated. As another example, a meta-analysis supported by Merck concluded in 2001 that no increased risk of arterial thrombosis existed with the company's drug rofecoxib,21 but a meta-analysis not supported by industry showed an increased risk,22 which was apparent in publications available to the authors of the industry supported meta-analysis. Rofecoxib was withdrawn because of thromboses in 2004. Our examination of the comparative z scores revealed more scatter than expected, which indicates that some effect estimates might have been biased, and, furthermore, that the confidence interval in a meta-analysis generally exaggerates the precision in the underlying data. Industry supported reviews of drugs are less transparent than Cochrane reviews and have few reservations about methodological limitations of the included trials; their conclusions should be read with caution. We believe that details of concealment of allocation, blinding, inclusion and exclusion criteria for trials, search strategies, and estimated effects in each included trial need to be reported to allow readers to judge the reliability of reviews. To improve transparency, access to the protocol should be available. Protocols for Cochrane reviews are published in the Cochrane Library, and protocols for other systematic reviews can be registered free of charge at the UK national research register through the Centre for Reviews and Dissemination in York, UK. We thank Stefan Leucht, Deborah J Cook, Deborah Goebert, Michael Ludwig, Max H Pittler, Chiel Springer, Steven L West, Frederick A Spencer, and Patrick Chien for providing information on support and funding of their studies and the Iberoamerican Cochrane Centre, Barcelona for providing study facilities. Contributors AWJ wrote the draft protocol and manuscript, and PCG contributed. AWJ and PCG extracted data. JH did the statistical analyses that compared estimated treatment effects. All authors commented on the final manuscript. PCG is the guarantor. Competing interests AWJ and PCG are affiliated with the Nordic Cochrane Centre. The views expressed in this article represent those of the authors and are not necessarily the views or the official policy of the Cochrane Collaboration.
. Pharmaceutical industry sponsorship and research outcome and quality: systematic review. BMJ 2003;326: 1167–70.
. Scope and impact of financial conflicts of interest in biomedical research: a systematic review. JAMA 2003;289: 454–65.
. Association of funding and conclusions in randomized drug trials: a reflection of treatment effect or adverse events JAMA 2003;290: 921–8.
. The Cochrane Collaboration—principles. www.cochrane.org/docs/tenprinciples.htm (accessed 18Sept2006). et al. Methodology and reports of systematic reviews and meta-analyses: a comparison of Cochrane reviews with articles published in paper-based journals. JAMA 1998;280: 278–80. et al. Systematic reviews and meta-analyses on treatment of asthma: critical evaluation. BMJ 2000;320: 537–40.
. Guidelines for reading literature reviews. Can Med Assoc J 1988;138: 697–703.
. Meta-analyses to evaluate analgesic interventions: a systematic qualitative review of their methodology. J Clin Epidemiol 1996;49: 235–43.
. Validation of an index of the quality of review articles. J Clin Epidemiol 1991;44: 1271–8.
. Does blinding of readers affect the results of meta-analyses Lancet 1997;350: 185–6. eds. Cochrane handbook for systematic reviews of interventions 4.2.5 [updated May 2005]. www.cochrane.org/resources/handbook/hbook.htm (accessed 19Sept2005). et al. Agreement among reviewers of review articles. J Clin Epidemiol 1991;44: 91–8.
. Systematic reviews in health care: assessing the quality of controlled clinical trials. BMJ 2001;323: 42–6.
. Allocation concealment in clinical trials. JAMA 2002;288: 2407–8.
. Assessment of methodological quality of primary studies by systematic reviews: results of the metaquality cross sectional study. BMJ 2005;330: 1053.
et al. Selective serotonin reuptake inhibitors: meta-analysis of efficacy and acceptability. BMJ 1993;306: 683–7.
. Meta-analysis: unresolved issues and future developments. BMJ 1998;316: 221–5.
. Effective and acceptable treatment for depression [letter]. BMJ 1993;306: 1125.
. Publication bias: evidence of delayed publication in a cohort study of clinical research projects. BMJ 1997;315: 640–5.
. Study of information submitted by drug companies to licensing authorities. BMJ 1980;280: 833–6. et al. Cardiovascular thrombotic events in controlled, clinical trials of rofecoxib. Circulation 2001;104: 2280–8.
. Risk of cardiovascular events and rofecoxib: cumulative meta-analysis. Lancet 2004;364: 2021–9. et al. A study of manufacturer-supported trials of nonsteroidal anti-inflammatory drugs in the treatment of arthritis. Arch Intern Med 1994;154: 157–63.
. Commercial sponsorship and the Cochrane Collaboration. www.cochrane.org/docs/commercialsponsorship.htm (accessed 16June2005).
. Steroids and peptic ulcer: an end to the controversy J Intern Med 1994;236: 599–601.
. Variability in meta-analytic results concerning the value of cholesterol reduction in coronary heart disease: a meta-meta-analysis. Am J Epidemiol 1999;149: 429–41.
. Meta-analysis of clinical trials as a scientific discipline. II: replicate variability and comparison of studies that agree and disagree. Stat Med 1987;6: 733–44.
. How objective are systematic reviews? Differences between reviews on complementary medicine. J R Soc Med 2003;96: 17–22.
. Meta-analysis of second-line antirheumatic drugs: sample size bias and uncertain benefit. J Clin Epidemiol 1992;45: 587–94. et al. Stress ulcer prophylaxis in critically ill patients: resolving discordant meta-analyses. JAMA 1996;275: 308–14.
. Screening for breast cancer with mammography. Cochrane Database Syst Rev 2001;(4): CD001877.
. The need for caution in interpreting high quality systematic reviews. BMJ 2001;323: 681–4.
. Are authors' financial ties with pharmaceutical companies associated with positive results or conclusions in meta-analyses on antihypertensive medications? 5th International Congress on Peer Review and Biomedical Publication, Chicago, 16-18 September 2005:16 (http://www.jama-peer.org/).
. Quality of Cochrane reviews: assessment of sample from 1998. BMJ 2001;323: 829–32.